Michelle Obama has always been an incredible role model when it comes to leadership, equality, and class. She inspires millions around the world on a daily basis, and we are here for it. Michelle reinvented the role of FLOTUS through her compassionate initiatives and tear-jerking speeches. Oh, and let's not forget her incredible dance moves. In case you needed proof that Michelle Obama was the ultimate queen, here are 11 times we absolutely lived for her and her beautiful soul. 1. When she created her female education initiative, Let Girls Learn. Launched in 2015, Let Girls Learn addresses the challenges that prevent young girls from getting an adequate level of education. The initiative was created to empower girls to reach their full potential, giving them the necessary tools to create lasting change. The Obamas recognize the challenges adolescent girls face when it comes to education. With a strong focus on community-based solutions, Let Girls Learn's purpose is to bring people together to create solutions and provide girls a platform to make positive contributions to society. 2. When she made headlines with her inspiring motto. Michelle's 2016 Democratic National Convention speech is still being talked about to this day. She inspired us all by sharing how she and Barack guide their children; how they're raised to be the bigger person, always. "We insist that the hateful language they hear from public figures on TV does not represent the true spirit of this country." "We explain that when someone is cruel or acts like a bully, you don’t stoop to their level. No, our motto is, when they go low, we go high." 3. When she decided she needed to meet the portrait girl. Parker Curry, a two-year-old girl, was at the Smithsonian National Portrait Gallery when she became awestruck by Michelle Obama's portrait. The photos of her went viral. So viral, in fact, that the image even reached Michelle. So she arranged a meeting...and a dance party. Parker's mother stated, "She believes Michelle Obama is a queen." Don't we all? Michelle shared their dance party on Instagram, captioning it, "Keep on dreaming big for yourself...and maybe one day I'll proudly look up at a portrait of you!" 4. When she empowered us with her number one daily habit. For International Women's Day, Michelle did an interview, in which 20-year-old Pearl Quarmyne from Ghana asked her, "What is the most effective daily habit you possess?" She responded, “give myself permission to be happy." "As women, this can be challenging because we’re not always taught to do it." "We feel like it’s somehow selfish. But I’ve learned that when I actually put myself on the priority list along with everyone else in my life, it actually benefits them, too." Basically, love thy self! 5. When she absolutely killed it in Carpool Karaoke. Michelle served up some realness with James Corden on Carpool Karaoke. Her playlist included Stevie Wonder’s "Signed, Sealed, Delivered" and Beyoncé’s "Single Ladies." Soon enough, Missy Elliott joined them in the back seat for another dance party. I'm seeing a trend here. 6. When she went on a shopping spree with Ellen Degeneres. Now this is a duo I'd like to hang out with. 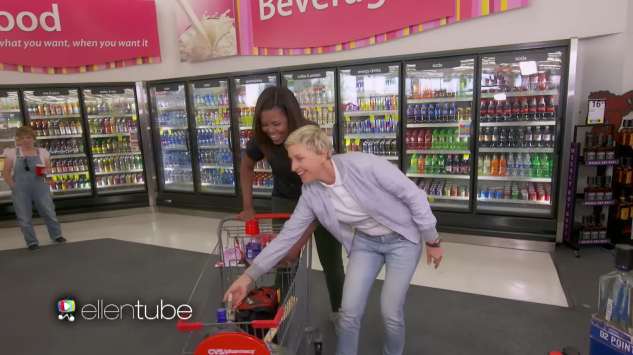 The two wreaked havoc at a local CVS while Ellen taught Michelle how to survive life after the White House in the "real world." 7. When she graced us with a powerful speech at BET’s Black Girls Rock! Awards. The first African-American FLOTUS taught us all a lesson in redefining standards. "Yes, I decided to rewrite those tired old scripts that define too many of us. I decided that I wasn’t bossy, I was confident and strong." "I wasn’t loud. I was a young woman with something important to say." "And when I looked in the mirror I saw a tall, beautiful and smart black girl, and that’s what I want for you. I want you to live life on your own terms." 8. When she used social media to promote healthy eating. She went viral, yet again. But this time for a vine that parodied Lil Jon's "Turn Down for What," remixing it to "Turnip For What." Leave it to Michelle Obama to make turnips cool. 9. When she created the Let's Move! initiative. Michelle started Let’s Move! in 2010 in an effort to end childhood obesity and ensure that today's children can grow up happy, healthy, and able to pursue their dreams! The initiative helps provide families with access to healthy, affordable food, and healthier foods in schools. 10. When she gave us the evolution of mom dancing. Michelle showed us all how down to earth she is when she went full mom on The Tonight Show Starring Jimmy Fallon. She's not a regular mom, she's a cool mom! 11. When Michelle bid farewell to the White House. At a ceremony nearing the end of her time as First Lady, she shared, "To the young people out there, do not ever let anyone make you feel like you don't matter or like you don't have a place in our American story because you do. And you have a right to be exactly who you are." SHARE if you think Michelle Obama is the queen we all deserve.